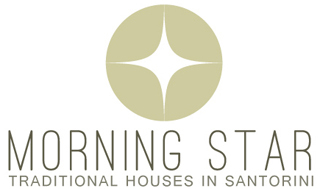 Morning Star Traditional Houses is a traditional cluster of three traditional houses overlooking the stunning sea view and morning sunrise. The houses have a panoramic view and they are semi-detached. Located in the beautiful and tranquil village of Exo Gonia, close both to Pyrgos and the beach of Kamari. Nature generously gave to Santorini all the beauties. Sunrise is equally beautiful to sunset. Before the Morning Star gets lost in the sky, the scarlet dawn fills the horizon, behind Anafi, with colors that even the most imaginative painter could not capture on the canvas. With a cup of coffee in our home’s balconies, you will enjoy this feast of colors away from the noise with the companion of the wind’s rustle and the bird’s tweet ripping the wind as they flutter in the few trees of Exo Gonia. The Morning House Traditional Houses in Santorini are an ideal choice for visitors seek for a beautiful and serene stay on the island. The three different types of the Morning Star Traditional Houses are ideal for families, group of friends and couples. From your host’s warm welcome you will enjoy your stay in the traditional houses created to share our passion for continuing the famous Greek and Santorinian Hospitality.